Artist's rendering of the Woodall Rodgers Park. We've mentioned before about Dallas' plan to cover Woodall Rodgers Freeway with a deck park, and now more details are coming together. Riding high off pulling in $16.7 million in stimulus funds, the deck park now has accelerated their timeline to start building the 5.2 acre pedestrian connector next month instead late this fall. A groundbreaking ceremony for the park will be held Sept. 14 with the usual local dignitaries and a team from Archer Western, who's just been selected as the construction team for the project. While that's all good for the folks involved, what does it mean to Dallasites looking to get over the freeway and into the Arts District? Joanna Singleton with the Woodall Rodgers Park Project tells us that Harwood street over the freeway may be closed as early as "late September" but that the timeframe could shift if TxDOT and Archer Western don't agree on a start date. In 2011, when the project is hopefully completed, cars won't even be dealing with Harwood. The street will go completely pedestrian when the new green space is finished. 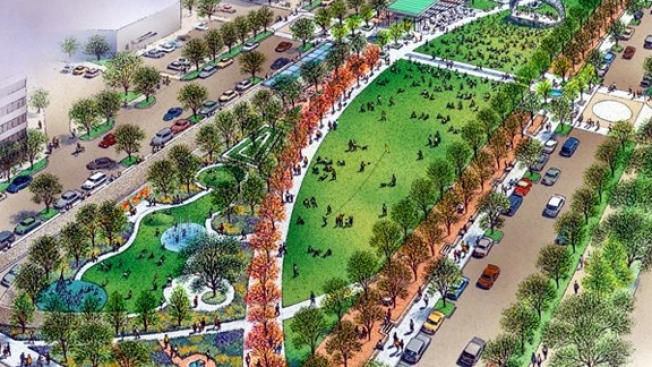 There are good reasons to walk through the new park besides just getting from Uptown to the Arts District -- a children's park, dog park, and outdoor performance pavilion are all scheduled to be installed.